26 Rainbow kites were amusing to see and fly when a train of Steve Edeiken's colorful display danced the atmosphere with innovated dual line stunt flying "Circus In The sky"
Steve inspired me to attend the Washington International Kite festival where I won the most uniquely innovative Kite award. 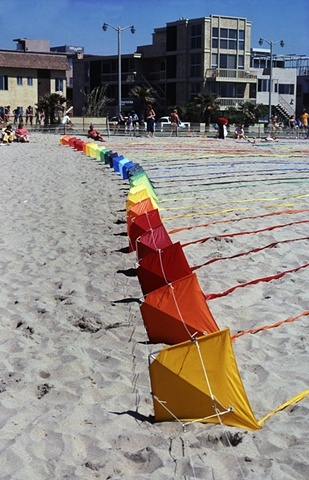 It was constructed with a plastic super market bag and flew for all three days of the festival. Visit the previous image at: rvmann.com/artwork/2677238_The_little_k?